Malcolm Fraser died today, March 20, 2014. Although loathed by a large section of the population because of his role in usurping Gough Whitlam, in what many believe was a CIA coup, Malcolm Fraser since redeemed himself in many ways by advocating more thoughtful and responsible policy in Foreign Affairs. The current government and opposition are unlikely to acknowledge this most valuable role because it was critical of both of them. In recent interviews Fraser deplored the gung-ho and dishonest attitude of the west in pursuing wars and warned of the dangers to the world if the West continued to dismiss the legitimate concerns of Russia, the East and the Middle East. 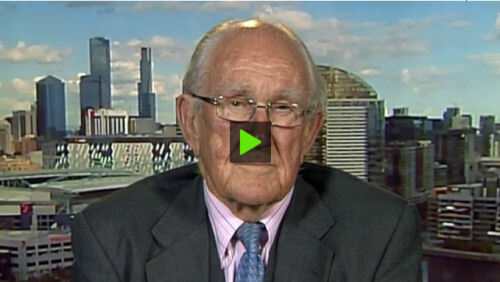 In this video and transcript, first published on 7 August 2014, Malcolm Fraser describes US/NATO moves on Ukraine as provocative. Russian stance justified. America feels it can break international law. The West should not, under any circumstances, involve itself militarily in the affairs of Crimea, Ukraine. Ukraine should be free to make whatever economic relationships it likes with other countries, whether with Russia or the West or both, but it should not become part of a defence bloc, a military block, and therefore [...] should not be eligible to join NATO, which Russia would reasonably interpret as provocative. Agrees that most Australian politicians showing poor judgement on Ukraine, Putin. Thinks this is partly influenced by mass media through deliberate slant. The original title of this interview was "Cold War and Peace", published on rt at http://rt.com/shows/worlds-apart-oksana-boyko/147013-oldwar-and-peace/. MF: It was certainly ill-advised but this has been done. What we now have to try and do, or what Russia, I believe, and the West need to try and do if peace is to be maintained, and if there can be a degree of trust established, is to persuade both the parties in the Ukraine that they must learn the art of compromise. The current government doesn't, to me, have a great deal of credibility because it was, really, installed after great violence and a coup from the streets. But, alright, it happens to be there. But if there could be elections across the Ukraine, properly supervised, properly monitored, across the whole country, and then you have a situation in which the European Union, the United States and Russia are all saying to those who are most friendly to them in the Ukraine itself: 'look, if you want one country, you've got to learn to live together. Take this opportunity to establish a parliament that will be your government'. And then I think you'd also need to say that Ukraine should be free to make whatever economic relationships it likes with other countries, whether Russia or the West or both, but it should not become part of a defence bloc, a military block, and therefore, as Henry Kissinger said a few days ago, it should not be eligible to join NATO. I think that would be absolutely essential to gain Russian support for such a proposal because if I were Russian, I would believe that NATO has been trying to seduce the Ukraine, although it's friendly to the West, to force the situation so that the Ukraine will become part of NATO. "I have watched Oksana’s interview with Fraser. I’m a great fan of hers, but I must admit also of Fraser. Perhaps I don’t have to struggle with the evident baggage of those who lived here while he was PM, but even they would admit to his change of mind which sees him even on the ‘left’ of the Greens. What really made a difference for me was meeting him with Mother Agnes Mariam last June, and hearing him talk about his experience in the Balkans when he was head of CARE. This seems to have turned him against the US in a fairly solid way, following the illegal NATO bombing campaign against Serbia. Mother Agnes of course is not a great admirer of the US, and shared her views on the centrality of the CIA in fomenting conflicts. I understood Fraser to feel that, in relation to the US, Australia’s agreement – the ANZAS treaty - was only an agreement to come to each other’s aid if one was threatened by a foreign power. It wasn’t an agreement to cooperate in fighting the other’s wars, and this was entirely undesirable. Fraser also told us how he had met Vladimir Putin at that time, and found him a very smart as well as ‘amusing’ man. I would like to know what Fraser has to say now, following the downing of MH17 – I’d be surprised if he is suffering the delusions being encouraged by our media and governments. It’s getting hard to keep up!" As Malcolm Fraser is laid to rest, it seems that some will work to see his views on the ANZUS alliance buried with him and at a time when our allegiance to the US is drawing us ever deeper into their wars. What irony indeed that SBS, the broadcaster that Fraser launched, should be assisting at this burial with a couple of highly partisan reports on ‘Dateline’ which directly contradict his views on Australia’s preferred ‘alignment’. While we paid little attention to Malcolm Fraser’s warnings over joining the West’s campaign against Syria, or supporting the US puppet government in Ukraine against Russia, we can still atone for this and pay our respects with ‘the debate we need to have’ on the US alliance. The minimum of political responsibility would mean that the Age would publish your letter. However for it to show such responsibility would be very surprising. The letter in question has not so far been published in "The Age"
And yet it is so important to world peace! I suppose that the mainstream media corporations are invested in the arms trade. I believe that their investments should be stated inside the front page alongside the names of proprietors and updated daily.